For a typical satellite, the journey to space begins with a multi-year design project, followed by an equally lengthy development phase. Add the subsequent wait time for the perfect launch window, and it can be 10 years before that idea-turned-satellite starts collecting data. Thanks to this tedious, expensive process, the world’s space-derived weather data is patchy and limited, leaving nations to compensate with ground-based radar… at least, nations that can afford it. In regions with meager infrastructure, companies and administrations are forced to make major, weather-sensitive choices based on incomplete information. Spire’s fresh approach to satellite production and data collection is removing Earth’s blind spots and putting space-based data into more people’s hands, helping them make better decisions. “Making space more accessible is not necessarily about giving everyone access to a satellite, but about giving them access to the benefit of having one,” said Theresa Condor, EVP, Spire Global. Instead of photographing large swaths of Earth to “look” at weather, Spire’s nanosatellites use GNSS radio occultation to “listen”. Without the need for lenses, these bread-loaf-sized orbiters are smaller (10cm x 10cm x 30cm) and easier to construct — working together as a network to rapidly map weather systems. For those concerned with space junk, this self-cleaning army of low-orbiting satellites eventually burns up in the earth’s atmosphere, simply ceasing to exist. Spire’s rapid iterations cut that above-mentioned 10-year timeframe down significantly: satellites are built in one week and launched in batches every six to eight weeks. Within one standard design, software updates completely change a satellite’s functionality, a revolutionary concept in the space arena. This large scale focus drove Expon Capital’s involvement. 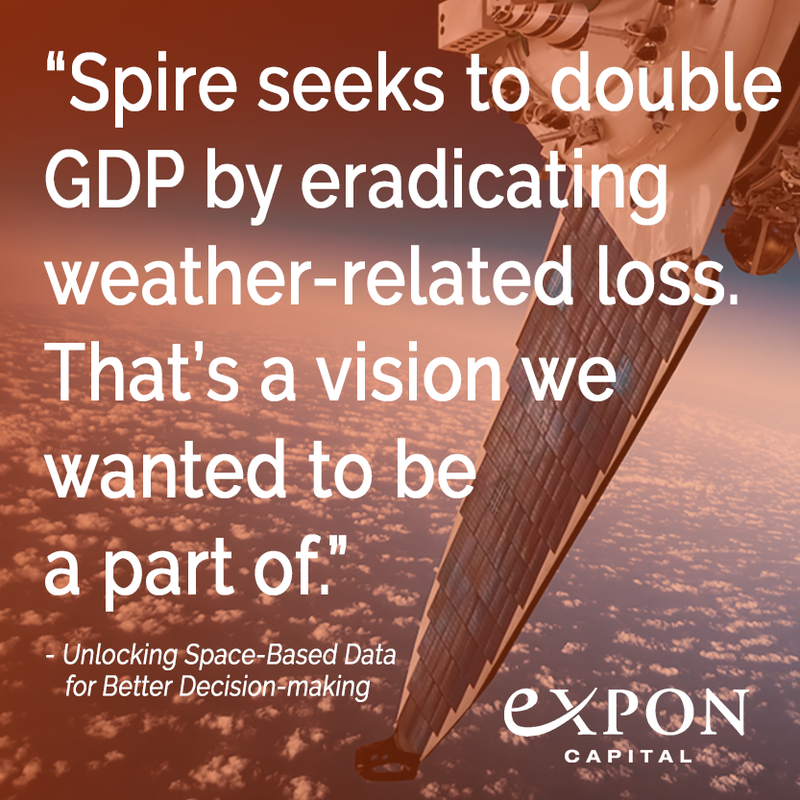 A venture capital firm concerned with massive transformative purpose, the team was inspired by Spire’s vision to strengthen businesses, economies and nations through accessible, serviceable space-derived weather data. Spire works to reduce the $2.5 trillion in mitigatable losses that occur annually due to inaccurate weather forecasting. “They seek to double GDP by eradicating weather-related loss. That’s a vision we wanted to be a part of. Spire’s unparalleled infrastructure ($100+ million in deployed infrastructure) and unmatched proprietary analytics capabilities are simply leaving the competition behind,” said Marc Gendebien, Managing Partner, Expon Capital. 95 percent of weather-forecasting information comes from a small number of polar orbiting satellites and a handful of lone geostationary satellites pointing in one direction 24/7 and taking images of massive portions of Earth. Operations and communities in regions without supplementary ICT infrastructure are left vulnerable and in the dark. However, in 15–20 years more than 50 percent of global GDP could flow from these so-called developing regions. By improving the quality of space-based data collected in rural areas and making it available to decision-makers, Spire lets businesses and societies take control of their own fates. Regardless of where an organization is operating, it can tap into actionable insight beyond what a country’s on-the-ground infrastructure enables. Detailed, updated weather data is something few entities currently have access to, allowing natural disasters and weather systems to, at best, threaten commerce and, at worst, threaten lives. Early on, the team identified a need for improved visibility of Earth, including weather monitoring but also extending beyond it, for example, to ship and airplane surveillance, trade-route mapping and tsunami detection. With multiple revenue streams, the company is targeting $1 billion in revenue by the mid 2020s. Due to Spire, industries traditionally vulnerable to weather, such as mining in rural Peru or farming in Australia, can now utilize the same quality data as residents of New York City — datasets that, until now, were nonexistent. By unlocking space-derived insight for more groups, Spire ultimately contributes to better decision-making. And that’s good news for all of us earthlings.